December 19, 2018 (Atlanta, GA): The state of Georgia continues to supply many of the top college football programs in America with talent at all positions. 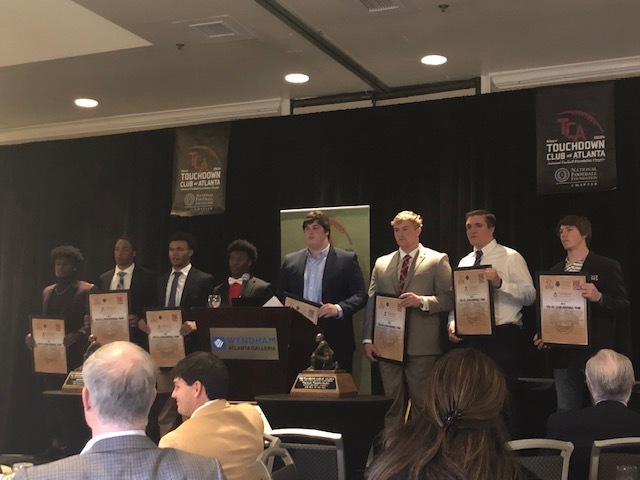 This year Georgia produced seven 5-star players, and 4 of them celebrated their signings at the 680 The Fan/247 Sports signing day event at Sport & Social in Battery Park. It was a great day with 50 players from 10 schools participating, MC’ed by Rusty Mansell and Doug Konkel. The day kicked off with a star-studded group headlined by UGA commits WR Dominick Blaylock (5-star Walton) and TE Ryland Goede (Kennesaw Mountain). Both will have a chance to make an early impact for the Bulldogs. Another 4-star in the early group was DT Christopher Hinton (Greater Atlanta Christian) who will be heading to Michigan next year. After the big announcement that Justin Fields was transferring from UGA, they made a late push to get QB Zach Calzada (Lanier) to switch his commitment, but he stayed true to Texas A&M. Watch his announcement below. Two players from Riverdale High were in the next group, headlined by TE Jaelyn Lay who is off to Clemson. Then it was time for the champs to make their announcement. 7A Milton High had four players in attendance, after shocking the GHSA world with a huge title win over nationally ranked Colquitt County. Milton QB Jordan Yates is heading to Georgia Tech and DB Joseph Charleston will join a big group from Atlanta at Clemson. Creekside High was represented by Taj Dodson, who will head to SEC upstart Kentucky next season. A huge group from Grayson attended the event. The Rams had two 5-star players signing their letters of intent today, OT Wanya Morris (Tennessee) and DE Owen Pappoe (Auburn). They were joined by others including Kevin Harris II (Alabama), Kenyatta Watson II (Texas), and Jakai Clark (Miami). Tyrone Hopper from Roswell High made an appearance to sign his letter to join the Florida Gators. Listen to him explain his decision here. The next big group was from the Buford Wolves, who were led by 5-star OL Harry Miller (Ohio State). 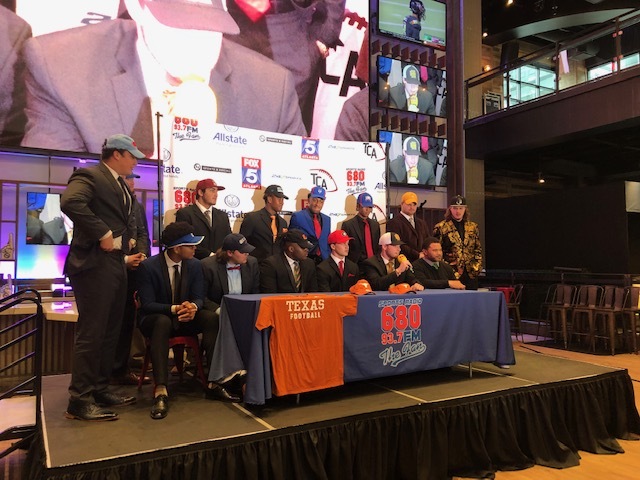 He was joined by RB Derrian Brown (Texas), Jalar Holley (Miami) and a pair of Ole Miss offensive linemen in Reece McIntyre and Carter Colquitt. The day’s final signee was RB Tahj Gary from Woodward, who will play for the Virginia Tech Hokies next season.